Ever wondered about that whole crackle nail polish trend? Yea, me too. I think we may be on the tail-end of this trend, however, I do see new crackle color shades coming out (e.g., OPI’s limited edition Pink Shatter for Breast Cancer Awareness Month), so maybe the crackle nail polish trend still has some legs. I bought the Sephora by OPI Blasted Nail Colour in Blasted Gold. I figured that the gold would work well with my warm skin tone. 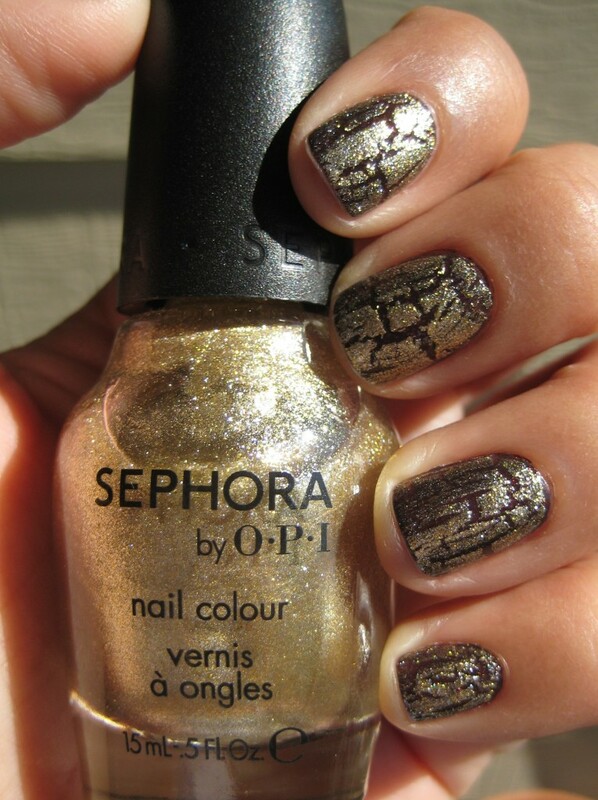 According to Sephora’s website, the polish gives a “blasted effect [of] opaque gold with fine iridescent glitter”. The way these products work is that you apply it as a top coat to your already applied and dried polish. I’ve tried wearing this blasted gold with other colors and in this post, I pair it with OPI’s Tease-y Does It, a deep purple with glittery flecks. After polishing my nails with the solid color, I then applied the Blasted Gold top coat. The top coat must be applied to dry nails, or it won’t work properly. You apply the blasted coat just like a regular polish. As the blasted coat dries, it shrinks into the crackle effect. It’s pretty cool to watch. Finally, I recommend finishing with a clear top coat so that you get maximum shine. The Good: You can see from the photo that the parts of your nail that stay gold have pretty opaque coverage. The glittery effect is very pretty and highly-reflective of light. And since the “blasted” effect is meant to be random, you don’t need to be so exact when applying it. The Questionable: The Blasted Gold covered up most of my nails, and I wish that the top coat would shrink more. In the end, you don’t see much of my purple polish underneath. Also, the formula is very thick, so I don’t anticipate this bottle lasting very long. The Verdict: It’s a novel effect, but I think the crackle trend is best suited for nighttime looks. The Blasted Gold really sparkles and looks fun in the evening, but it’s not a very professional look. During the summer, I wore the Blasted Gold on top of a light grayish-blue polish, which was a little more subtle. And I’ve never tried the Blasted on my toes, because I think that would just look weird. This entry was posted in Vanity and tagged blasted top coat, crackle nail polish, glitter, gold, judicial review, nail shatter, OPI, Sephora by OPI on October 11, 2011 by jenn. Yeah, my toenails already look “blasted” which means it’s time for a pedicure….